This holiday month has just flown by. I can't believe it is almost the new year! It's been a pretty magical month. With good grades coming out of the fall quarter (my gift from myself was a raised GPA), tons of family fun and a few creative projects, I feel that I am headed into the new year with a renewed spirit and a joyful outlook. I hope you enjoyed Never Say Never November's playlist. 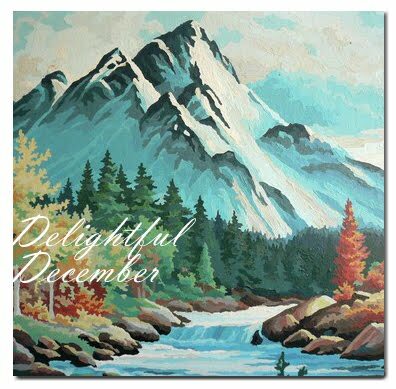 I know I did, but I have to say that I am pretty fond of the Delightful December melodies. If you like paint by number art, you can buy the print used for this month's album cover on lunaparkfoundry's etsy site...assuming I don't get there first! To listen to the playlist, go to Grooveshark *here* and hit "play all" once it has loaded. en-joy!